Antwerp is known as the aristocratic city of Belgium. This remarkable city is located in the north of the country and is the capital of the province of Antwerp. The city is one of the most important commercial centers of Belgium. In Antwerp there are many multinational corporations and the port is one of the busiest and important in Europe. It is the second largest port in Europe after Rotterdam and has a population of about half a million people and with the number of suburban residents it is nearly 1.2 million people. Antwerp is located on the right bank of the River Scheldt, which flows into the North Sea. 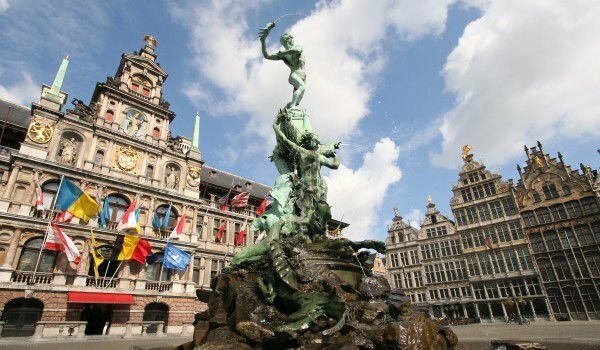 According to popular Belgian folklore, Antwerp was named after the mythical giant Antigoon, who lived near the river. The giant required a fee from those who wanted to cross the river. Those who refused to pay would have one of their hands severed off one of their hand then it would be thrown into the river. The mythical giant was defeated by a young man named Brabo, who heroically managed to cut the giant's hand and threw it into the Scheldt. Thus became the name of Antwerp - Dutch werpen means throw. For a long time Antwerp was an important city for the countries of Benelux. This is an economic union between Belgium, Netherlands and Luxembourg. Walk through the beautiful squares and streets of Antwerp and you will definetly be impressed. You can start at the Grand Market Square. In the western part you will see the interesting building of the City Hall, built between 1561 and 1565. In front of the City Hall can be seen the beautiful statue of the giant that is Antigoon, who gave his name to the city. Also here you can see the female statues symbolizing justice, prudence, Virgin and others. One of the architectural and historical sights of Antwerp is the church of St. James. It was built in the Gothic style as the hostel for pilgrims to Santiago de Compostela. Be sure to go in and see the grave of the famous painter, Rubens which located in the eastern chapel of the church. The church was constructed somewhere around 1431, on this site was located another building, which was a stopover on route to the place where James the Apostle was buried in Santiago de Compostela. The construction of the church that can be seen today began in 1491 and it wasn't until 1656 that it was complete. As a result, the architectural trends in this century, the interior of the church was built in the Baroque style. When drawing the plans of the church in Antwerp it was predicted to have a tower with a height of 150 m. This was well above the two planned towers of the Cathedral of Our Lady, each of which is high by 123 meters. Due to financial problems in the 16th century, the tower was erected only 1/3 of the plan. Another unmistakable architectural landmark is the Cathedral of Our Lady. It’s construction began in 1351 and the first phase ended in 1521 and it remains unfinished. The architecture of the Cathedral of Our Lady is mainly in the Gothic style, however there are a lot of baroque elements. The tower with a height of 123 meters is the tallest church tower in the Benelux. Quite interesting is the construction of the Farmers tower, which is the second largest building after the Cathedral of Our Lady. It has a height of 100 meters, making it the first 'skyscraper' built in the territory of mainland Europe. Construction of the building was completed in 1931 by then its height was only 87.5 meters. In the old part of the city, you can visit the historic medieval Het Steen Castle, which was built between 1200 and 1225. Today, this historic castle is considered the oldest building in Antwerp. Parts of the castle were demolished to make way for a road connecting southern and northern parts of the port. Since 1952, the castle has been a museum of Maritime History and also a war memorial for Canadian soldiers from World War II.